So co-op games with Lord Crumb…haven’t talked about those in a long while. Mostly because I haven’t been able to play them or circumstances have gotten in the way. 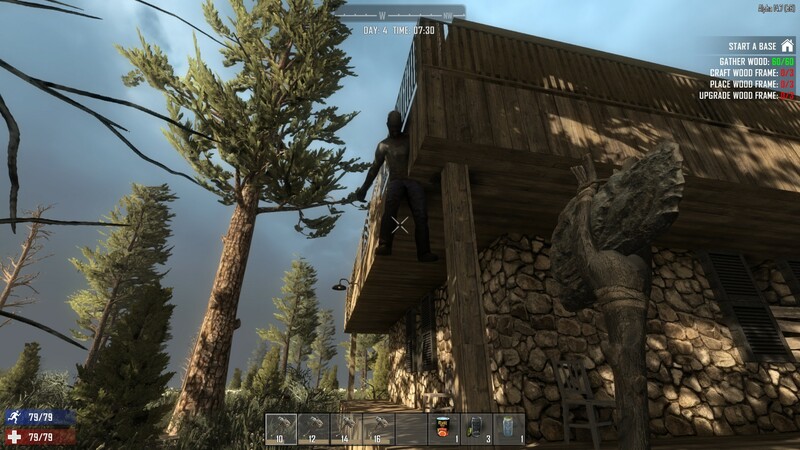 But the two of us are back together like some sort of ’90s boy band (except I’m a woman) and we began our return with the zombie-survival-crafting-building game 7 Days to Die. Creating a co-op game was actually pretty painless. On the new game screen, I just chose Survivial MP as the game mode, set it as a private game with a password, and started it up. Lord Crumb joined through Steam’s Join Game option and after entering the password, got right in. Of course, I discovered later that you can change the settings on an existing game…oh well. Anyways, this changed the game to the point where it still had some difficulty (we still died sometimes) but it was fun and not frustrating. On this attempt, we took refuge in a church (I’m sure there’s a trope in that somewhere) mostly because it was getting dark, it was close, and in that lighting, it looked like it was made out of stone. It was actually made out of wood but it still proved to be rather secure. There was a coffin on a platform though which made it a little eerie. 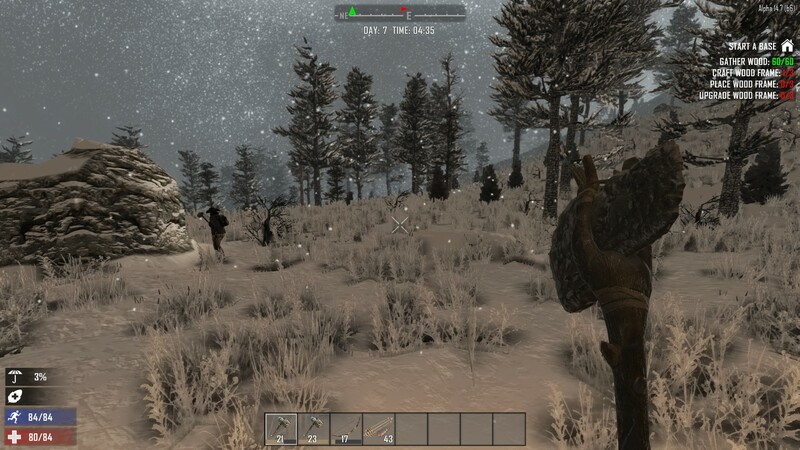 It turned out to be an even better choice because it was isolated (so less zombies spawned nearby) and was next to an abundance of resources. So over the next few days, we gathered and crafted in relative peace. 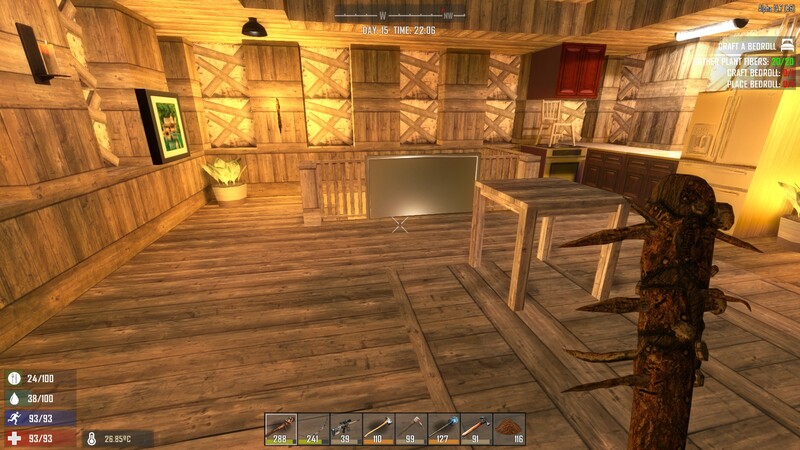 One of the major things we wanted to craft was a forge, which would give us access to iron tools. Unlike Minecraft, 7D2D does not make this easy. The most difficult component to collect were 20 animal hides. Ever chased a deer with a stone axe? We sure have. Crafting bows and arrows helped speed this up a little bit but it still took us a while to gather all of the needed hides. Once we did though, we came to a bit of a dilemma. The forge couldn’t move once it was placed and since it was so expensive to make, we needed to be sure of where we wanted to place it. Did we really want to stay in the church? That’s when Lord Crumb came across a two storey building that was once an information centre, and the first storey was made of stone. It wasn’t too far to the west so we reclaimed it from its “previous” inhabitants and moved all of our stuff in there. Listen bub, I don’t care if you’re stuck in the floor, this place is ours now. 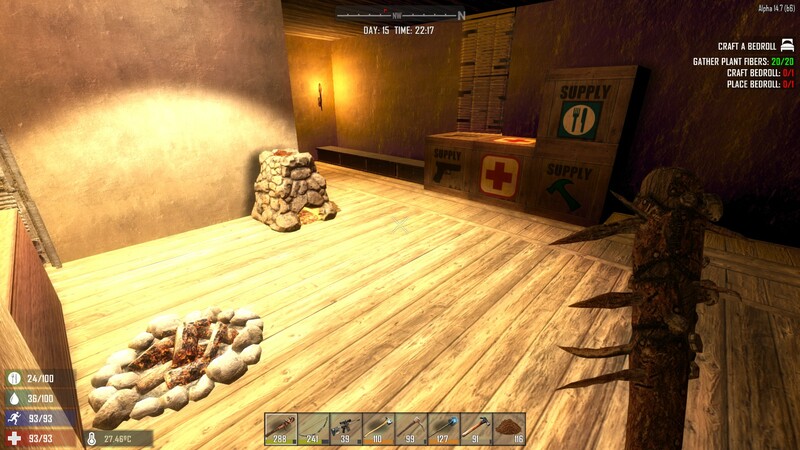 We reinforced all of the walls on the first floor, moved in our materials, and built the forge and campfire. The upstairs is where our bedrolls went, as well as any decorations we found. Can’t have a post-apocalyptic refuge without a flat-screen TV that doesn’t work. It turns out that the pine forest biome we’re in varies wildly in temperature. We’ve had sweltering heat and falling snow in the same day. How many games actually change the terrain to reflect the weather changes though? 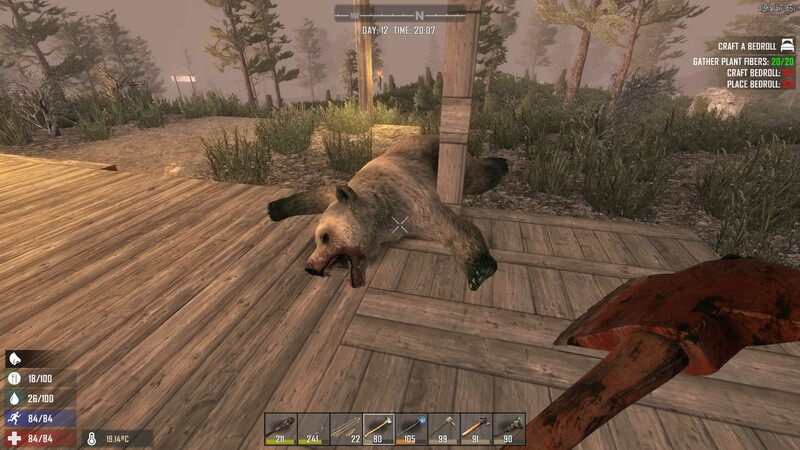 While this area is also fairly isolated, the forest spawns something even more dangerous than zombies: bears. They hit like semis and are really hard to kill. Once we had not one but TWO spawn near our house and I believe it took 6 shots from the sniper rifles we were carrying to bring each one down. You’re going to make an excellent rug. The current state of our game is that we’re digging out a trench around our base so that we hopefully won’t have zombies right at our doorstep anymore. I’d also like to get a farm going without having to worry about trampled fields. We had a few issues with the process, like Lord Crumb getting the idea to use TNT to speed up the process and not realizing that it doesn’t come with a fuse. Not only were there little bits of him everywhere, but the noise drew every zombie within hearing distance. To be fair, there was another time where he was off scavenging and I was intently working on the trench when a zombie dog leapt onto my head. 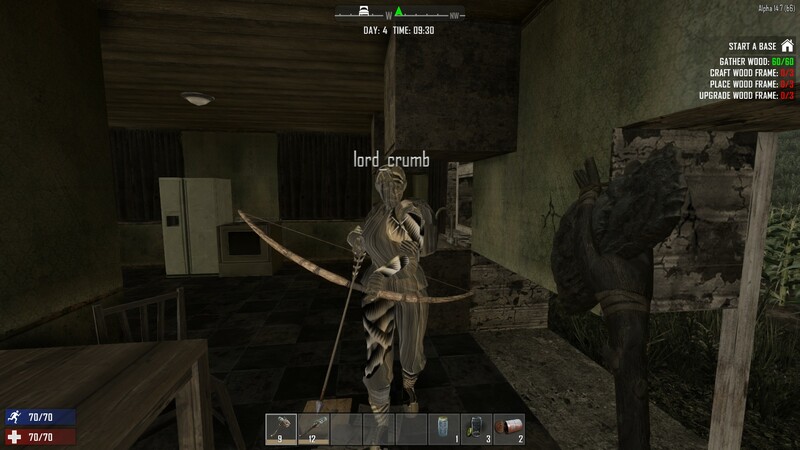 I almost blew out Lord Crumb’s eardrums when I yelled and cursed as I dashed frantically into the house. I don’t do well with jump scares. Additionally, Lord Crumb has just finished two minibikes for us so we can go riding around in style, and at a good speed as well. They’ll make scavenging and exploring so much easier. 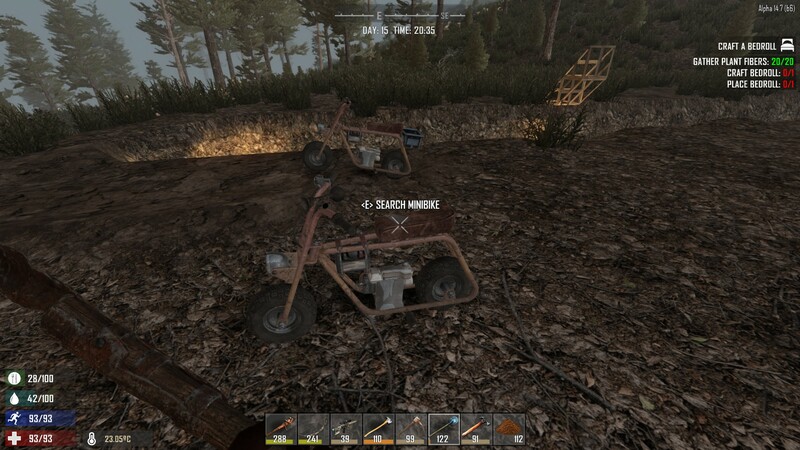 Minibikes! He still needs to add a shopping basket to mine. All in all, it’s a pretty fun game with quite a bit to do. It’s lacking a little in polish (and more bugs need squashing) but as an Early Access game, I’d say it’s well on the way to being amazing. Agreed! The whole process is very fun and satisfying. I like the challenge of the beginning but I also like the toys that you get later on. And so much has changed since the last time I played that it feels like a whole new game. It’ll be really interesting to see what the final game ends up looking like. Yea, you got a post out too! I haven’t played, but looked interesting. I like the savaging and survival part, but zombies kept me a way. Lord crumb looks like they are sporting a new age camouflage, something of the trash motif. I did! Seeing you post really motivated me to finally finish this one, even though I lost a good portion of it previously. I don’t find the zombies to be too scary, although I’m glad I turned off them being able to run at night. I will admit that I’d have a hard time playing the game if I didn’t have someone to play it with. When alone, I do feel nervous all the time, hence the yelling when a dog pounced on me. I think that would get in the way of my fun if I had to be alone all the time. But having Lord Crumb around helps me relax and enjoy it because I know he’s got my back (most of the time). I hate the survival genre of games and even I am tempted to give this a try after that write-up. Thanks, and keep up the good work. Thanks! 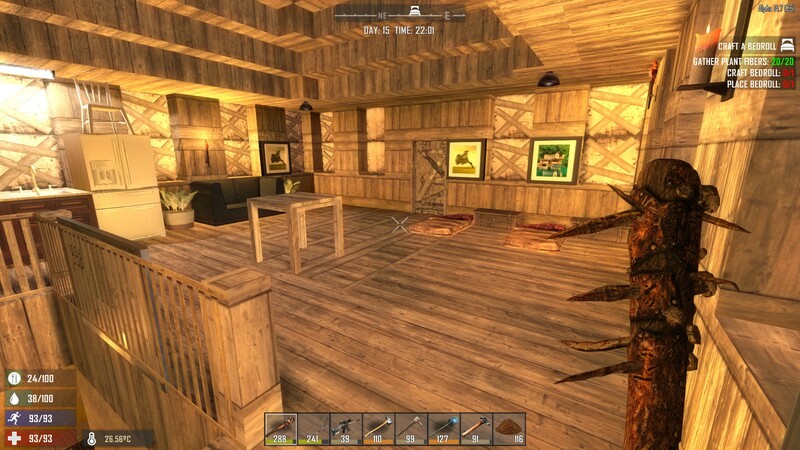 I should warn you that there’s things like stamina, food, water, temperature, and diseases to deal with so it’s something to keep in mind if you don’t like survival games. But I find that 7D2D does it in a more immersive way than some games. Similar to The Long Dark I’d say.